We’re partnering with Bike Shop Girl Family Cyclery on a fun and very informal gathering on Thursday mornings in February–Coffee Outside! This is for people who like bikes and walking and making coffee on a park bench! 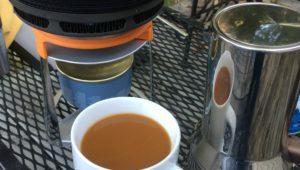 We bring our camp coffee brewing set-ups and a premade pot of coffee from Logan House Coffee for a social hour, every Thursday morning from 8:15 to 9:15 at 26th and Fulton Park, Denver. We talk bikes, coffee, and have a casual social hour to break up the week. The space is covered and there is a playground for the kids.